In 2016, BEC Consultants prepared a Nature Conservation Management Plan for an upland site in Co. Wicklow on behalf of An Óige Youth Hostel with funding from The Heritage Council. The site covers 26.9 ha and is located at the base of Knockree Hill in the Glencree Valley. The site is currently an important recreational amenity for hostellers, locals and members of the public. A diverse range of habitats are present including bracken, woodland, semi-natural grassland, hedgerows, scrub and calcareous springs. The Glencree River forms the southern boundary of the site. An Óige highlighted several nature conservation issues that they wished to address at the Knockree site. These comprise invasive bracken, river bank erosion, lack of tree regeneration, the presence of non-native trees, hedgerow damage and litter. BEC Consultants conducted a detailed ecological survey of the Knockree site, to evaluate the site and identify all nature conservation issues. Based on this site evaluation, management aims were developed for each of the habitats and features present at the Knockree site. The site was then divided into management zones and the main actions to be undertaken in each zone identified. A Gantt chart showed the timing of specific management tasks. Guidance was also provided to on how to monitor and review of the success of the Nature Conservation Management Plan. 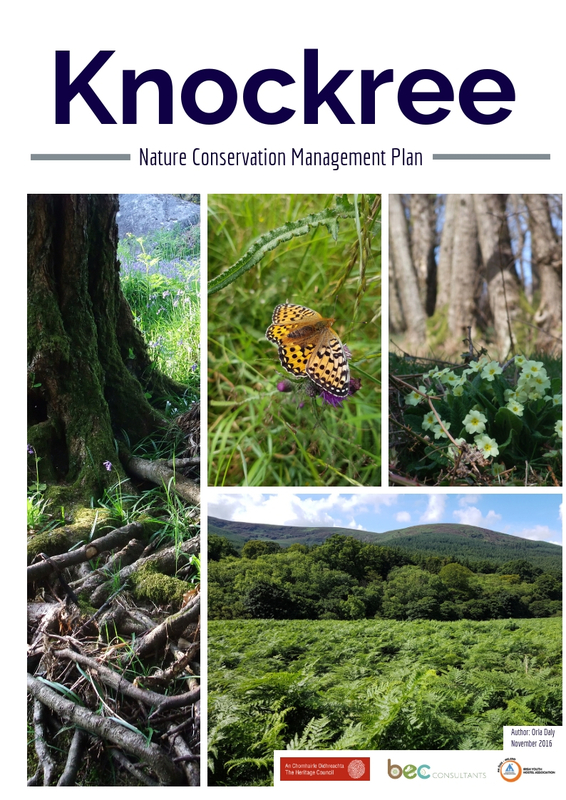 The Knockree Nature Conservation Management Plan will help conserve, enhance and restore the Knockree site and protect it from exploitation. It is the intention that the habitats, ecosystems and biodiversity within the site will be sustainably used by the hostelling association and visitors. The current plan establishes a framework of practical works to be carried out at the site. It can also be used as a tool to secure funding for conservation works. Click here for a short video on the project created by An Óige conservation group. Daly, O. 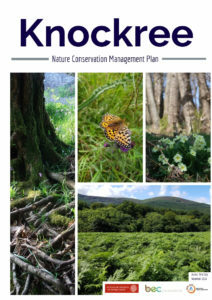 (2016) Knockree Nature Conservation Management Plan. Unpublished report submitted to the Heritage Council, Church Lane, Kilkenny, Ireland.